Not risks versus rewards, because the two are not polar opposites locked in a tug-of-war. They exist semi-independently, hopelessly entangled but able to be measured independently. Reading through this post on risks gave me mixed feelings. I was happy that other people are doing similar things to what I laid out in The Law... I was once again upset that numerous people showered the author with adoration and praise for revolutkonary thinking, when I've been stomping around in this territory for the better part of a decade. Different actions are flavoured by varying outcomes and varying risks. This is an inherent part of "The Law". The actual rolling of dice remains consistent, but it's the potential positives and potential negatives that lock the die roll into the unfolding narrative. To ensure something runs according to plan, you need to establish a distinct set of procedures that cannot be varied from. In web design this means creating pages that display consistently, regardless oc the user's browser or device set-up. 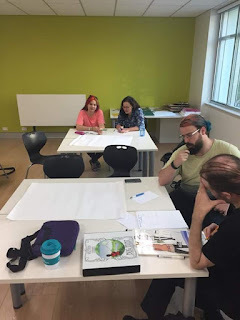 In boardgame design (or most other game design), it means writing a coherent and logical rule set that functions effectively with a range of different players and play styles. I'm probably over simplifying things here, but it's what I aim towards in my designs. At the moment, I haven't been updating the blog much...maybe getting two posts in each week, rather than a post every day or two. 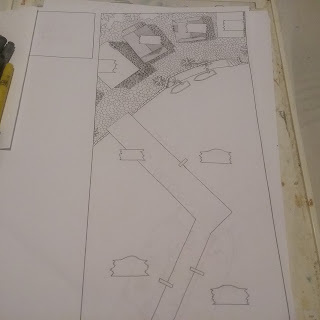 That's because I've been focusing on my map tutorials, and getting the website stuff done for the new LARP. I want to tell people what I'm doing, but it's more important at the moment to just do it. There's an adage in writing that you should write what you know. Some take this literally, saying that no--one should be writing fantasy, because no-one lives fantasy...but that's a bit silly. If you read a lot of fantasy, and know the tropes, how they work, know how to modify or subvert them for your own work, then you know your stuff. If you know art theory, then you could easily add elements of this into your work, alluding to colour, shape, and tne psychological way these impact on characters or readers. If you don't know these things, tnen trying to add them in will ring false. I guess it's a bit like that old "cultural appropriation" bugbear, if you add stuff in from another culture just because "it's cool" then it won't seem authentic... if you add stuff in and really connect it to the other things you've got going on then it will add depth to the final product. 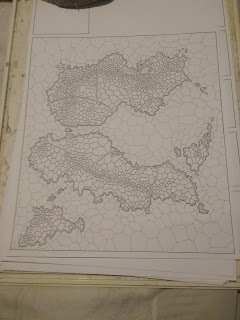 I've now drawn up about 30 pages of tutorials, so to break things up I'm now drawing up a few complete maps that incorporate elements reflected in the instructions. I'm working on a couple of signature pieces for my mapping tutorials. These signature pieces combine elements that will have been brought up throughout the tutorial lessons... showing how they can be combined into something interesting. Friday night. I attended a three hour class on game design by Steve Dee from Tin Star Games. I've known Steve for years on social media, and vaguely remember meeting him at one (or both) GenCon Oz convention(s) about a decade ago. Back in those days there weren't many of us designing games in Australia, and in the intervening years, Kickstarter and Patreon have changed the game design landscape dramatically. There are numerous design groups, playtest groups, podcasts and reviewers, new conventions, and expanded gaming space in wider pop culture conventions. It was appropriately described as a renaissance in gaming at the beginning of the class. Wow. It's a week into the new year, and this is my first post for 2018. It's been pretty hectic. First, Vulpinoid Studios has begun to live up to its name. We have a visitor in the house who has seen to that. Second, we've had a friend over for the holiday period. He's an old friend who has shared the Solstice-Christmas-New-Year weeks with us every year for the past decade, more a family member than a friend, he's helped us out in hard times, and we've done the same for him.